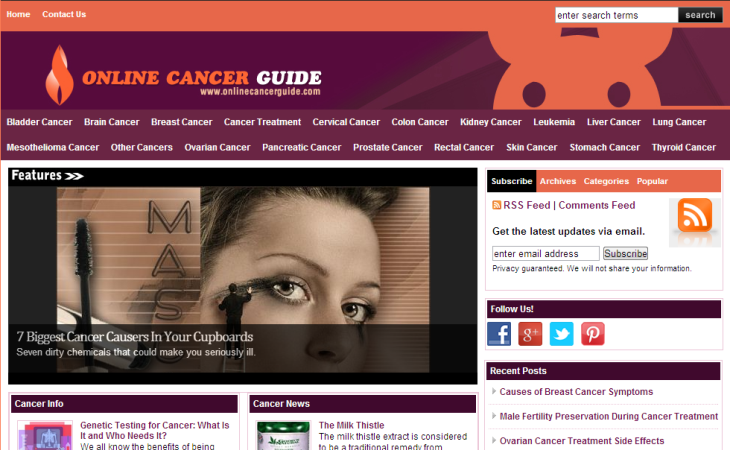 OnlineCancerGuide.com Current and concise information on types, symptoms, causes, diagnosis and possible treatments for cancer. A blog dedicated to tracking and posting information on all types of cancers. Regularly updated with posts on causes, symptoms and treatment methods for various cancers such as prostrate cancer, breast cancer, lung cancer, leukemia or blood cancer, skin cancer, throat cancer, brain cancer, colon cancer, mesothelioma, ovarian cancer, cervical cancer, etc..